MyLights – Wireless Home Lighting Starter Pack Special offer – Sale On Now! homeSpecials and Air Conditioner SalesMyLights – Wireless Home Lighting Starter Pack Special offer – Sale On Now! Introducing Ambience Air’s MyWelcome Wireless Home Lighting Starter Pack Special offer. 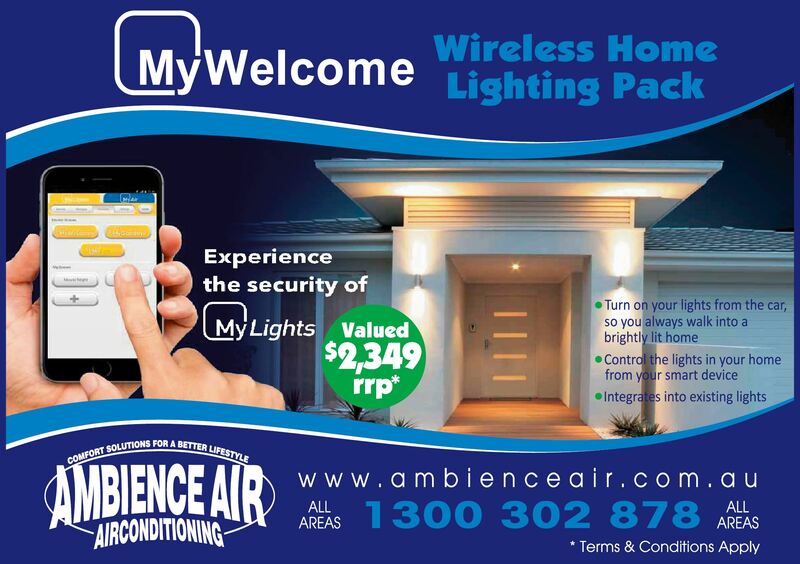 Ambience Air have teamed up with Advantage so contact us to control the lights in your home from your smart device and enjoy the security, convenience and comfort of being able to control your lights remotely with our new MyWelcome smart lighting special offer. Turn on your lights from the car so you always walk into a brightly lit home. Integrates into your existing lighting or can be upgraded to include new LED lights if required. Includes a wall mounted touchscreen Tablet allowing you to adjust your lights inside the home. Tablet can become a central hub as you can load up other smart home products along with other apps. 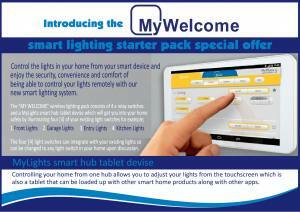 Call 1300 302 878 and light up your lifestyle with our MyWelcome smart lighting starter pack offer today. Whatever it is you require, we have the smart MyLights solution. Building a new home – Send us your electrical house plans and get a quote today. 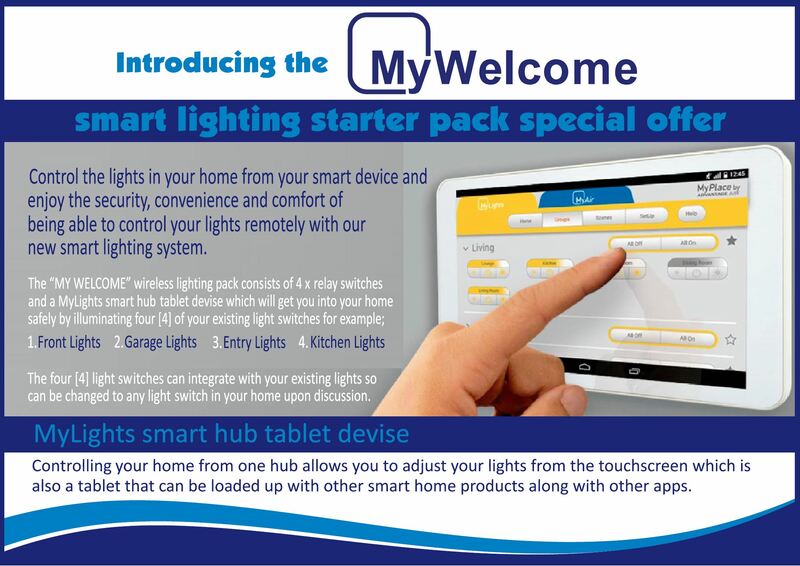 The MyWelcome pack can be added to include your entire home lighting system so see in store for details and enjoy the security and comfort of a MyLights solution in your home today. WHY WAIT? OWNS YOURS NOW with our affordable finance solutions. GET PRE-APPROVED FINANCE for your home or office comfort solution now. *With flexible finance options available to suit your individual needs simply click on the package that suits you and get pre-approved finance today. *Pre – approval on 6 month interest free finance. *Pre – approval on 6 – 48 months finance packages. OR – PAY LESS PAY CASH – contact us to find out how much cash of comfort you can save today! Call us on 1300 302 878 (all areas) to save thousands on your new comfort system this month. We are offering bonus incentives to win your business on all systems this month. Contact your nearest Ambience Air showroom today. SALE IS ON NOW SO DONT MISS OUT. You will save thousands on this sale so don’t delay, limited stocks available so contact your nearest Ambience Air showroom or call us now on 1300 302 878. Call your local Ambience Air store and make an appointment for your free in home quote, or in our showroom consultation bringing your floor plans and take this opportunity to save thousands today. Either visit one of our conveniently located showrooms close to you with your home / office floor plans or call your local Ambience Air store for your free in home consultation and we guarantee to save you hundreds, if not thousands off your new comfort system today. Show us your existing written quote and with no obligation, we will assist with advise to explain what you are about to invest in, compare your existing quote with what we have to offer, then with our huge buying power will beat it every time both in quality and investment value. We have easy finance packages from 6 – 48 months such as deferred payments and interest free finance options to suit your individual needs so don’t delay, get pre-approved now and take advantage of these incredible savings. CALL US NOW ON 1300 302 878 all areas OR CONTACT US TODAY! ALL PRICES SLASHED DURING THIS SALE SO DONT MISS OUT! – GET A QUOTE and keep your family comfortable today!